Telnet Client is used to connect to remote machines by using the Telnet protocol. For example, I'm an old fashion IT guy, and I still like to configure Cisco Switches/Routers using Telnet. If you started to use Windows 7, you will notice that telnet is not enabled by default!! Don't panic, it is just a matter of few clicks and Telnet will be enabled again. Telnet Client allows a computer to connect to a remote Telnet server and run applications on that server. Once logged on, a user is given a command prompt that can be used as if it had been opened locally on the Telnet server's console. Commands that you type at the Telnet client command prompt are sent to the Telnet Server and executed there, as though you were locally logged on to a command prompt session at the server. Output from the commands that you run are sent back to the Telnet client where they are displayed for you to view. Click on Start then left (right click if you have reversed your mouse buttons) click once on Control Panel. 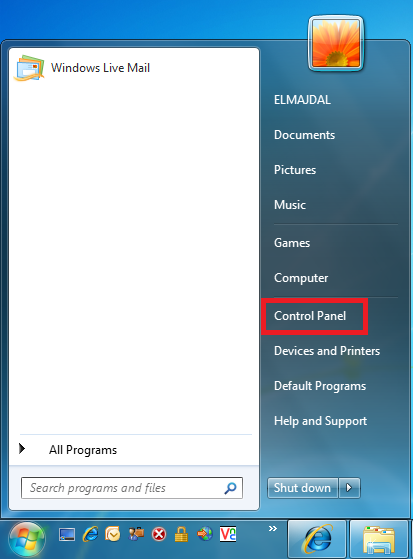 From Control Panel, click on Programs. 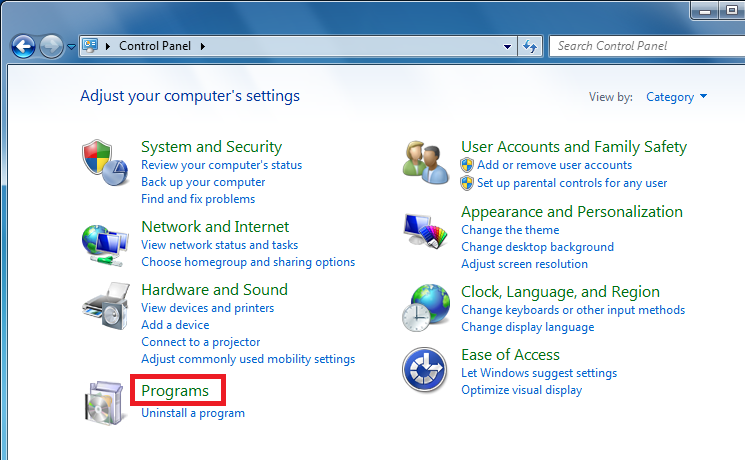 Under Programs and Features, click on Turn Windows Features on or off. From the Windows Features window, using the slider, scroll down till you reach Telnet Client, select the check box beside it, then click on OK. The selected feature will be installed. 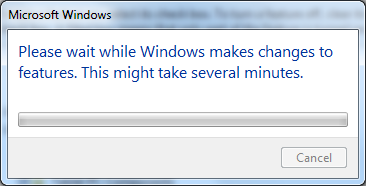 Once it is installed, the Windows Features windows will be closed. To confirm that Telnet is installed, open command prompt and type telnet /? 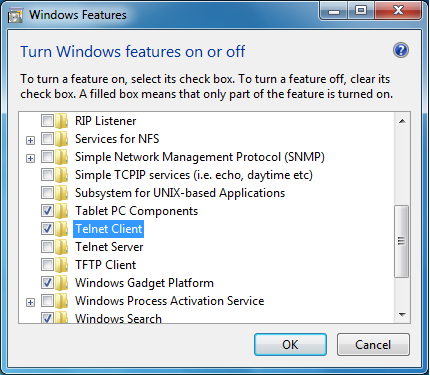 By default, Telnet Client is not enabled in Windows 7. To enable it, you have to add the Telnet Client Windows Feature.